First Lutheran Church, Palo Alto, California, was established in the summer of 1920 by undergraduate student, Bertram Swanson. It seems unusual for a student to be given the responsibility for gathering a congregation, since students are normally in their early 20s and have not had a lot of life experience. But the biography of Bertram Swanson reveals that he was older than the usual student and had had adult responsibilities since he was in his mid-teens. Carl Bertram Swanson was born August 25, 1894 in Drammen, Norway, the son of Anna Maria, born Högberg, and Peter J. Swanson. Both parents were born in Värmland, Sweden. Bertram was baptized in Bragernes Church, Drammen, and attend first grade in Norway. In 1901, he emigrated to America with his family, and continued his education in Chicago public schools. He was confirmed in 1909 in Lebanon Church, Chicago. In 1916, at the age of 21, Bertram resumed his education by entering high school in Willmar, Minnesota, and graduated after two and half years. In 1918 he served for seven months in the Signal Corps of the U.S. Army during World War I. Then, in 1919, he entered Augustana College in Rock Island, Illinois. A brief notice in the Swedish-language newspaper, Vestkusten, dated 19 August 1920, mentions that students Friedstrom, Friedlund, Johnson and Swanson, along with Miss Widing presented a program to the men’s group at Ebenezer Lutheran Church in San Francisco, the headquarters of the California Conference of the Augustana Synod. It also mentions that student Carl Okerblom from Augustana College had arrived the previous week to join students Friedström, Johnson, Friedlund and Swanson with their studies at the state university in Berkeley, and at the same time take part as much as possible in the work of the church. It appears that promising students from Rock Island were sent to San Francisco to help the California Conference establish new congregations. There were enough Swedish immigrants in the Bay Area to make the formation of Swedish Lutheran congregations a logical goal. Students Friedstrom, Friedlund, and Swanson were all involved in the early days at First Lutheran. In 1920, there were no automobile bridges across San Francisco Bay. So Bertram Swanson probably traveled from Berkeley to the Peninsula by taking a trolly to Oakland, the ferry from Oakland to San Francisco, then transferring to the Southern Pacific Railroad from San Francisco to San Jose for the the morning service, and back to Palo Alto for the afternoon service. In his report for the first congregational meeting of Bethlehem Lutheran, 11 January 1921, (typewritten in Swedish,) Student Swanson summarized what had happened in the first five months of the new congregation: “On 20 August 1920, 43 people signed the charter, and six more signed shortly after for a total of 49 charter members. Worship services have been held every Sunday afternoon in the Memorial Christian Church on the corner of Bryant and Channing Streets. October 17 was a big day when the congregation met and celebrated communion for the first time. Pastor C. O. Lundquist, the vice-pastor, presided at the service. At this service four children were baptized and the congregational officers were installed. “The Women’s Group first met on the 15th of July at the home of Mrs. John Lyons, and since then has met at other houses each month. The membership now stands at 29 members and we hope that will increase. The women have done well. On 19 November they held a sale and it was a big success. They must not tire in this important work. God will provide. “The Sunday School has gone forth beyond expectation. At first I though it was not worth having Sunday School for so few children. But I was wrong. Although the beginning was so small, I always hoped it would grow, and so it has this fall. The Sunday School now has 39 children, and we hope for more in the future. The Sunday School presented a remarkable program at their Christmas Festival. May God bless this branch of the congregation. 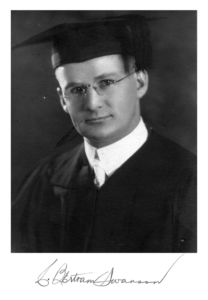 In the summer of 1921, Bertram Swanson returned to Augustana College, graduated in 1922, entered seminary, and graduated in 1925 at the age of 30. He was ordained in Minneapolis, married Vendla E. Person the same summer, and accepted a call to Zion Lutheran, Newman Grove, Nebraska. Subsequent calls took the family to Bethlehem Lutheran in Elgin, Illinois; Elim Lutheran in Fargo, North Dakota; and Augustana Inner Mission, Chicago, where Pastor Swanson became the executive director. At the end of his life, he served as associate pastor of First Church, New Britain, Connecticut. 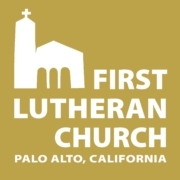 Pastor Swanson visited the Bay Area several times, and in 1940, participated in the 20th anniversary of the congregation he had established, by then called First Lutheran. Carl Bertram Swanson died on 12 August 1959 in Chicago while on vacation. He was survived by his wife, Vendla, and three children: Carl B. Swanson, Jr., Minister of Music; Mrs. Betty Hill; and Pastor Theodore N. Swanson.